Any coconut lovers out there? I loove coconut. I love it so much that during my dietetic internship I created a fake research project showing the benefits of coconut, wishing that one day it would be true! And according to many, that day has come! Or has it? All over the healthy eating world coconut oil has made its way to the forefront. Touted as being a “super food” critics are saying that coconut oil is a healthy fat replacement and has many medicinal properties. 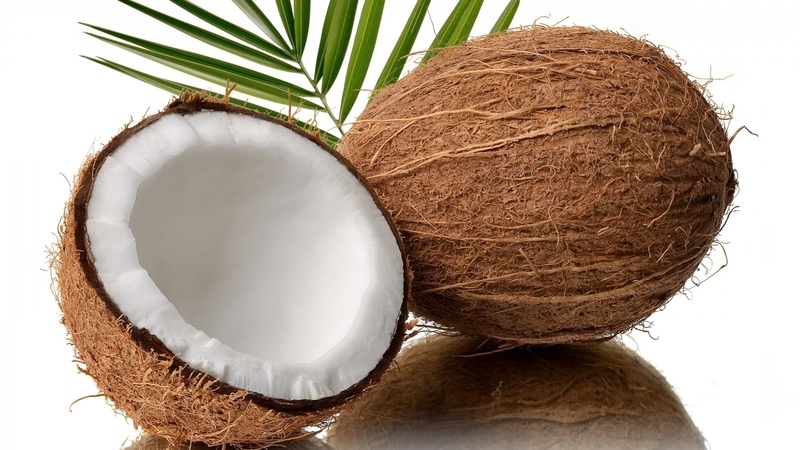 Coconut is a saturated fat, also known as an “unhealthy” fat. These are the fats that increase your risk for heart disease, whether they come from a plant or an animal. There is limited research showing the health benefits of coconut oil. While some smaller research results are positive, researchers are still waiting for larger studies and more concrete evidence. Coconut oil is better than fats such as butter or trans fat, since it does not contain any cholesterol. It is not recommended over liquid vegetable oils though, such as olive oil, canola or soybean. Like other fats, it is recommended to eat coconut oil in moderation. Until more extensive research is done on Coconut Oil, it should be treated it as a saturated fat. There may be a day when we find concrete evidence that the saturated fat from coconut oil is better than saturated fat from animal products, but until then use it in moderation. If you want to add fat to meals, try peanut butter, avocado, nuts, seeds and olive oil which are all monounsaturated (healthy) fats.